Building the right technology stack can provide substantial competitive advantage to your company. In stark contrast, the wrong one can cause under-performance and the downfall of your supply chain processes. From blockchain to artificial intelligence, IoT to machine learning – what technologies should your company consider? Similar to the industrial revolutions in the past, Supply Chain 4.0 requires the use of technology and process innovation to streamline global trade. The future of global trade is now. 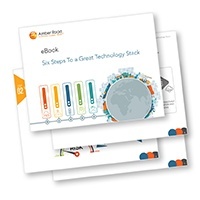 It’s time to build a strong value chain and reap the benefits of digitization - download this eBook today and learn how to build the right technology stack in six simple steps!